Today we woke about 6:30 and were down for breakfast less than an hour later. They serve what we Americans would think more of as lunch food at breakfast. There was an awesome rice noodle dish with cabbage and a little red chili flake heat. There was also chicken curry. And of course steamed rice and fried rice. They had eggs and french toast available as well. And really good fresh papaya, watermelon, and pineapple. Then we decided to take a walk. We looked at a map and had a destination in mind, but it was more about the journey. On the walk we saw lots of traffic, lots of little shrines, outside eating areas with cheap food sold by street vendors, Thai shanties along the rivers, and we met a Thai nun. We also got a quick glimpse into a Thai shanti town by missing a set of stairs and walking underneath a busy traffic bridge. The sound of the traffic became a dull hum when our ears were below bridge level. It was all covered by corrugated tin and fiberglass roofs, with very little sunlight coming through (I’m sure it would also keep all the rain out). The ground was all dirt, even inside the shops we past. We realized we should not be there (though we didn’t feel like we were in danger), so we turned around and found our way back. On street level, we then met Ying, the Thai nun I mentioned. One thing led to another, and she wound up showing us her temple (it was in on the fifth floor of a mostly empty office building) and talking to us about meditation as way to not do everything “automatically”, but with your mind present. We never did reach our intended destination, but we did see it from the temple window. We caught a cab back to the hotel, packed, and caught another cab to the airport to fly to Chiang Mai. In Chiang Mai, we discovered our new favorite sport – crossing the street! There are few traffic signals – we walked in Chiang Mai for seven hours today and came across one. Intersections consist of cars and scooters merging and negotiating with each other over who has the right of way. Crossing the street sometimes means you run against traffic as you weave across the lanes. It was fun when you realize that’s what you have to do. 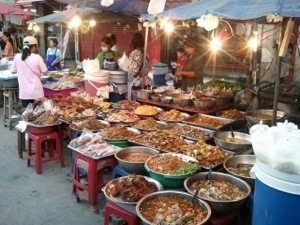 We did some shopping and had an amazing dinner of chicken larb – we bought it from a street vendor who had a dozen woks on display on the street – each full of delicious looking Thai food. They were flanked on either side by vendors with fresh cut fruit, whole cooked chickens, fried chicken legs, sushi, you name it. It was served to us in a bag with a bag of rice, which was interesting. We also found the most amazing mango and sticky rice I’ve ever had, also right on the side of the street. We did learn how to say hello – “sawatdee krab”, and how to say thank you – “kop koon krab”. Thank you has been a real challenge for me to remember, which is interesting because I like to express appreciation. im sorry I have taken so long to reply Class was good and tiring as usual…We did a wonderful interaction around two of the chapters: Resources and Boundries..I learned alot and it was a very intractive discussion..We missed you..
Im loving the blog descriptions..im able to live it a little with you which is fun..
im wondering if you can get to the Oriental Hotel in Bangcock..people go the just to learn Thai food it is so good ..See you soon!! Good to hear from you Susan. We did not make it to that hotel. The food here is absolutely amazing. I have never eaten such yummy food so consistently.